The peptide hormone insulin is synthesized, stored and secreted from ß-cells organised in islets. These islets are dispersed throughout the pancreas and represent only a small (1%) though vital component of the organ. Its relative or absolute deficiency leads to the clinical picture of diabetes. The most prevalent form of diabetes, type 2 or non-insulin dependent diabetes mellitus (NIDDM) presents a complex pattern of a polygenic disease . A number of clinical studies during the last years have put the pancreatic ß-cell back to the centre stage. Indeed, already before the establishment of clinically apparent NIDDM, secretion from ß-cells is diminished and this is seen prior to any alteration of insulin action on the peripheral target organs. Insulin secretion is mainly regulated at the level of release and proceeds by exocytosis that is the transport of hormone containing large dense core vesicles (LDCVs) from the trans-Golgi network to the plasma membrane and docking . They undergo a series of biochemical alterations driven by ATP and finally the vesicle membrane fuses with the plasma membrane subsequent to a rise in levels of free intracellular calcium . In molecular terms membrane docking and/or fusion is thought to be induced by the pairing of specific proteins on the secretory vesicles, termed v-SNAREs (i.e. VAMP) with cognate proteins on the plasma membrane, the t-SNAREs syntaxin and SNAP-25. According to structural data their cytosolic helices are entangled in a parallel four-helix bundle, the transmembrane domains of the SNARE proteins may equally play a role but precise knowledge is scarce. This complex is certainly rearranged during exocytosis and implies the function of chaperones. Ca2+ sensitivity is imposed on this process, at least in part, by the calcium-sensing vesicle protein synaptotagmin at a step occurring after the ATP-dependent priming. As the mechanism of insulin release is reasonably well understood in broad biochemical terms, we may address the molecular mechanisms and their regulation. Moreover, despite intensive research efforts new therapeutic principles targeted to the secretion of insulin, remain to be discovered. We concentrate our efforts on the study of three different proteins known to be involved in exocytosis: cysteine string proteins, the calcium-sensing protein synaptotagmin and the plasma membrane receptor latrophilin. In addition, we have recently engaged the study of their regulation in glucotoxicity. 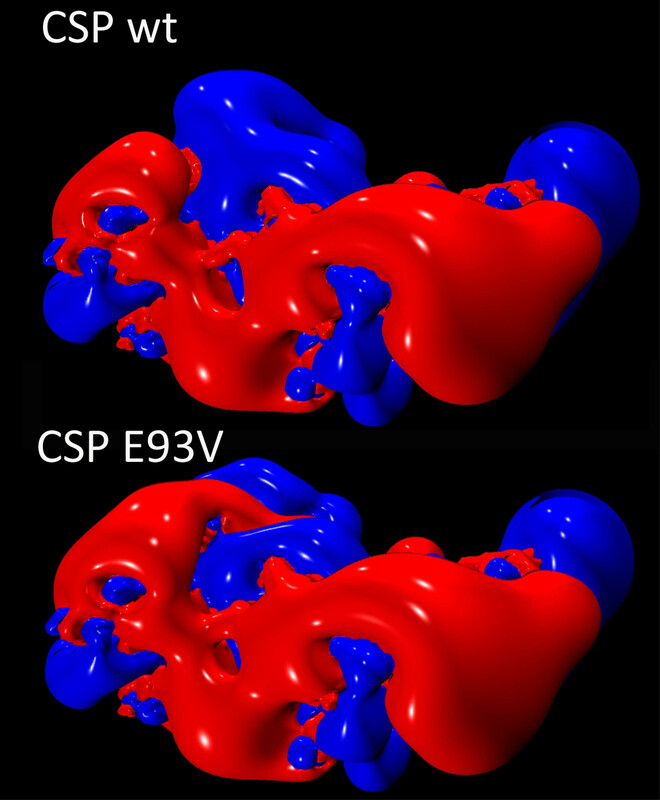 synaptotagmin 1 (top) and 9 (bottom). 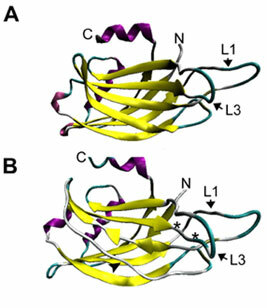 The best-characterized isoform of synaptotagmin, syt 1, binds phospholipids at low micromolar calcium and SNARE-proteins such as syntaxin and SNAP-25 at submillimolar levels of calcium. The 15 different isoforms currently known differ in their affinity to calcium and may mediate distinct transport steps as most transport from the ER to the plasma membrane is calcium sensitive. We have now cloned all the currently known isoforms either from ESTs or by RT-PCR to generate recombinant proteins and expression constructs and generated peptide antibodies to syt8 to 13. Our results indicate localization of these isoforms to distinct compartments in ß-cells, chromaffin cells and hippocampal neurons from LDCVs, lysosomes to ER-linked compartments [4-8]. Using siRNA based approaches, at least one of these isoforms qualifies as LDCV calcium sensor in secretory exocytosis. Grise, F., N. Taib, C. Monterrat, V. Lagrée, and J. Lang, Distinct roles of the C2A and the C2B domain of the vesicular Ca2+ sensor synaptotagmin 9 in endocrine ßcells. Biochem. J., 2007, 403: p. 483-492. A close collaboration with groups of the IECB (Oda, Laguerre) and the Faculty of Chemistry has allowed addressing the issue of SNARE-protein transmmbrane domains. 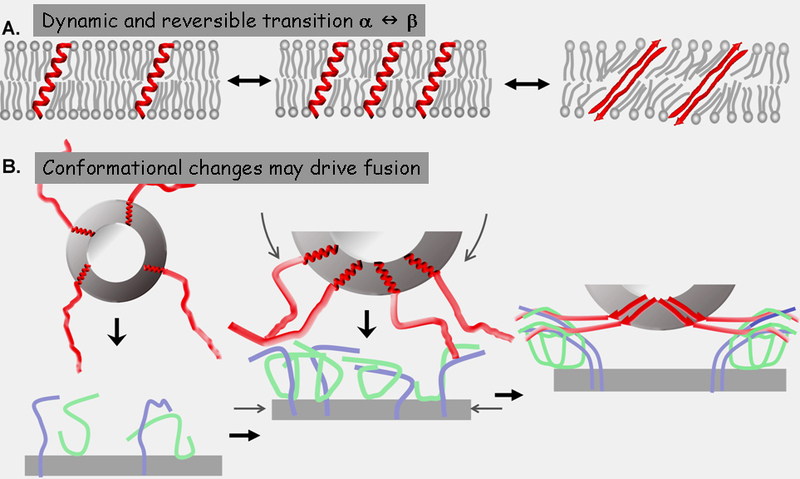 Our results demonstrate that the transmembrane domains exhibit unprecedented dynamics and switch from alpha-helices to ß-sheets in model membranes solely depending on protein/lipid ratios [9, 10]. This concentration-dependant switch in conformation could play an important role during membrane fusion, a topic we are currently pursuing further. Yassine, W., A. Milochau, S. Buchoux, J. Lang, B. Desbat, and R. Oda, Effect of monolayer lipid charges on the structure and orientation of protein VAMP1 at the air-water interface. Biochem. Biophys. Acta Biomembranes, 2010, 1798:928-937. Cysteine string proteins (Csp) are molecular chaperones located on exocytotic vesicles and are required for exocytosis to proceed , eventually by assisting in protein folding and rearrangement of complexes to optimize the fusion machinery for physiological demands. Csps have a defined domain structure though the precise role of the different domains remains unknown . We continued our previous studies on the latrotoxin-receptor latrophilin and its role in exocytosis . This unusual large G-protein coupled plasma membrane receptor, first described in the presynaptic part of the neuromuscular junction, is closely linked to the exocytotic machinery and expressed also in pancreatic beta-cells. It has been a long matter of debate whether the toxin uses the receptor just as an anchor to insert in the plasma membrane and produce calcium-influx or whether the receptor itself exerts an effect on exocytosis. We now have conclusive data that toxin-binding is insufficient to stimulate exocytosis and that receptor activation is required. Exocytosis is subsequently initiated by a series of events implying mainly regulation of VDCCs and potassium channels. Moreover, its activation leads to an enhanced calcium-sensitivity of the exocytotic machinery and mobilizes specific vesicle pools [17, 18]. In addition, we found that defined regions of the C-terminal intracellular domain of the receptor modulate its effects. Using pull-down approaches we have identified interacting proteins and their characterisation is in progress in collaboration with the group of J.M. Schmitter. Gut A, Kiraly CE, Fukuda M, Mikoshiba K, Wollheim CB, Lang J (2001) Expression and localisation of synaptotagmin isoforms in endocrine b-cells: their function in insulin exocytosis. J Cell Sci 114: 1709-1716.